Michael Wesch and his crew is at it again, with another intriguing video that tries to explain and capture our world — this time through the concept of information and what it all means in the digital age. As part of the K12 Online Conference, I have been most active in the Flat Agents of Change Ning site. One of the tools introduced there is Gizmo, an alternative to Skype that is designed to allow for easy recording of phone conversations. I set up and had a wonderful conversation with two of my fellow Ningers, Cheryl and Sarah, yesterday morning, via Gizmo. We chatted for about 30 minutes or so and it all seemed to work fine. But then I ran into trouble. First, the .wav file that Gizmo recorded would not open up in my Windows Media Player. It said that my player would not support the file type. So I tried to move it into Audacity, hoping I could convert it into an MP3 there. No luck. Then, I tried to send it to Zamzar conversation site and it came back as an empty file. No luck. Sarah had also recorded the session, so she loaded her file up into her PodcastPeople, but it sounded all squirrely in the playback mode. However, if you did the direct download from her show as an MP3, the audio file worked fine. So I took that downloaded file and then tried to upload it into my PodcastPeople site. Again, no luck. Like Sarah’s, it was all gobblygook. I didn’t give up (the mantra of Web 2.0ers everywhere). I took the MP3 download from Sarah’s site, and moved it in my Audacity, and the exported it as an MP3. I tried to then upload that into my PodcastPeople and, 18 hours later, PodcastPeople is still trying to digest the file. So here is the conversation. It was too long of a process, however, and I need to figure out if Gizmo is worth it. PS — Another element of the K12 Conference was a flickr group, where people from around the world submitted a photo or two of dusk on the last day of the conference (Saturday), and I took this photo of the set-up of a pumpkin contest in our neighborhood — I also took some video that I will try to share later this week. Here is the link to the When Night Falls flickr group. 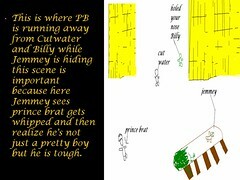 My sixth graders started out the year in literature class reading the short novel, The Whipping Boy, and worked on a storyboard project that uses the computer and Powerpoint to identify the main plot points in the book. The book is about a prince and his whipping boy and it is set in Medieval times (aka The Dark Ages). 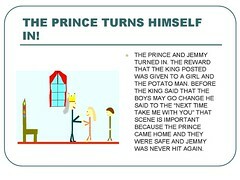 The story is a twist on the class Prince and the Pauper story. 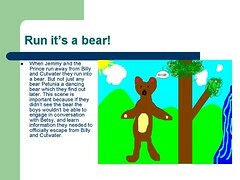 This use of Powerpoint allowed me to both introduce the program to the students (and get them using Paint for illustrations) and get a sense of their ability to identify main elements of a story. We shared these via our classroom blog, too. Some colleagues from the National Writing Project (Chris Sloan and Paul Allison) are also part of the K12 Online Conference and their work was released today and deserves a good listen as they discuss the ways they have nurtured two Elgg-platform social networking sites for middle and high school students. It is an amazing project and deserves kudos and attention. Along with the podcast and presentation, they are also opening up the lines of their Teachers Teaching Teachers weekly chat session at EdTechTalk to anyone interested in discussing the project. 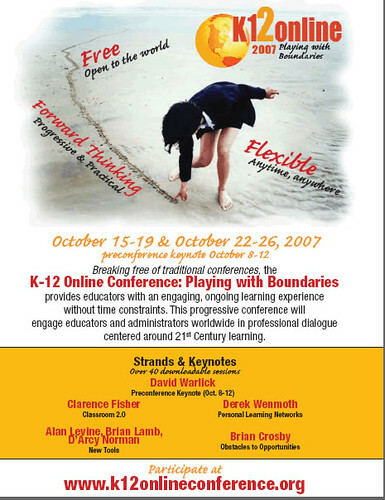 K12 Online Conference — We Get Released! Second, I created a podcast of my own. Take a listen. And how about the video? Edublogs allows you to embed it as a flash file (good) but the size doesn’t seem to be working right. Wow. It’s too big for my blog theme screen. Oh well, here it is and here is the direct link to my video tour of some of my blogs. I’ve been trying to set aside some time to explore the K12 Online Conference Workshops and keynotes, but it is difficult to carve out the hours needed. So I have tried to focus a bit on what I am interested in seeing what happens. I have been participating most in the podcasting workshop called Flat Agents of Change that uses a Ning site at http://bitbybitseedlings.ning.com/ to gather people together to use some tools for audio. I set up an account with Podcastpeople and it worked quite well, and I may use it for an upcoming workshop on podcasting. They also suggest using a site called Gizmo, which is similar to Skype but allows easy conferencing and recording of the conferencing for later podcasting (So you could interview and record in Gizmo, and then podcast it via Podcastpeople). I’ve also introduced a few forums there, and need to resist taking over their site. So, please, come join this podcast site and give the tools a try. I have followed the Release the Hounds workshop because I was interested in the concept of the “unproject” in which students propose and work on their own multimedia projects — primarily in math — and the teacher is a partner in the creation. But students have control over their learning. I tried to use the Trailfire in the Trailfire workshop because I like the idea of setting a “path” through the Internet for my students, and I even had a project in mind regarding Greek Gods and Myths in preparation for a novel we are about to read. But I just cannot get my Trailfire to work and so another kick in the tires for technology that is frustrating. I came upon a program called Jing for sharing screenshots and video tutorials, etc, during one of the presentations and I haven’t yet installed it but I am on my way. I want an easy way to share with others and I want it to be free. So, maybe Jing is the route — it seems interesting. On Monday, the K12 folks will be showcasing the workshop that Bonnie and I have created about our Collaborative ABC Movie Project and we certainly hope to have a lot of folks explore our project with us and also — even more important — to contribute to the hands-on portion of our workshop, which involves the use of VoiceThread to create a collaborative ABC project across the world. This is the final poem in my year-long project to create at least one poem per month for an entire year. Some months have been easier than others and the past two months, I have felt the well go a bit dry on me. But I wanted to wrap things up somehow and this poem came to me one early morning. My next step is to come back to all 31 poems (yep — 31) and see which ones are worth editing and revising and publishing. My intention is to use Lulu self-publishing to put together a book of the poems from the year. My sixth graders have been working on descriptive writing in class and the culminating project was something called the Monster Exchange, in which our young writers had to create a monster and then write up a one-paragraph story that featured good descriptive writing. Then, everyone got someone else’s writing and had to identify the creature in the story. I got the idea for the Monster Exchange years ago as part of an online, collaborative project in which students from different schools created illustrations, emailed them to each other, and then wrote up descriptions of the “visiting monsters.” I liked the idea and adapted it to the fact that I have four sixth grade classes (80-odd students) and they kids just love it. Download Video: Posted by dogtrax at TeacherTube.com. The K12 Online Conference kicked into high gear yesterday with the start of some workshops presentations. Everything seems to be podcasts and videocasts and there were some explorations of new tools and collaborative efforts in the workshops released into the wild yesterday (everything is virtual with K12).